The Penang Global Ethic Project developed gradually as a collaboration between several institutions. In December 2004, the exhibition 'World Religions - Universal Peace - Global Ethic' was shown at the Universiti Sains Malaysia (USM). The exhibition stimulated intense discussions between USM, the Konrad-Adenauer-Foundation, and the Malaysian Interfaith Network. It was felt that the message of the exhibition is highly relevant to a multi-cultural, multi-ethnic, multi-religious society like Malaysia, and should be more widely promoted in order to support and further the concept of unity in diversity. At the same time, the idea arose to localise the message in Penang, especially in the heart of George Town  a place where it is possible to find an Anglican church, a Chinese Buddhist temple, a Hindu temple, an Indian mosque, a Malay mosque as well as Chinese Confucian and Taoist temples all along the same street. After a few meetings with Lestari Heritage Network, an international cultural heritage network based in Penang, and other organizations and institutions, The Penang Global Ethic Project was finally set up. Officially launched in February 2006 with a series of lectures, forums, tours and exhibitions, The Penang Global Ethic Project will showcase Jalan Masjid Kapitan Keling (formerly Pitt Street) as Penang's 'Street of Harmony'  a special place where people of all nationalities, backgrounds and ages can learn about traditions of peaceful co-existence among communities of different cultures and faiths. Foundation. Click here for more details. 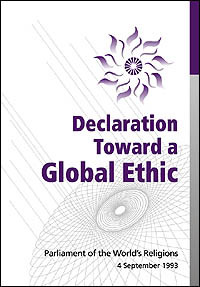 Message by Hans K�ng, President, Global Ethic Foundation, T�bingen, Germany. Click here for more details.